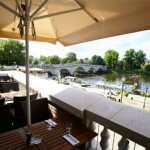 Part of a chain of five restaurants in London, it could be argued that Med Kitchen Richmond Riverside takes the prize for ‘best location’. Hiding behind a dentist’s surgery in Richmond is this intriguing Belgian basement restaurant. Laid back, family friendly place that is great for any occasion, whether or not you fancy combining it with a walk in the park.